I must say I changed a lot over the years. From a child who hated soup to somebody who appreciates the benefits and even the comfort of a good soup. The only two soups I would eat as a child, were chicken soup when I was sick and a special soup my mother made which was my favorite. It was the only soup she knew I would agree to eat. I always called it the bread soup. It was really called Cilantro soup, it had pieces of bread, poached eggs and of course lots of cilantro. I cannot describe the pleasure I felt when I ate it, I remember it was rich and so comforting. It has been so many years since I last ate it that I should really ask my mother for the recipe! Since then I always try to find soups which can emulate that happy feeling. 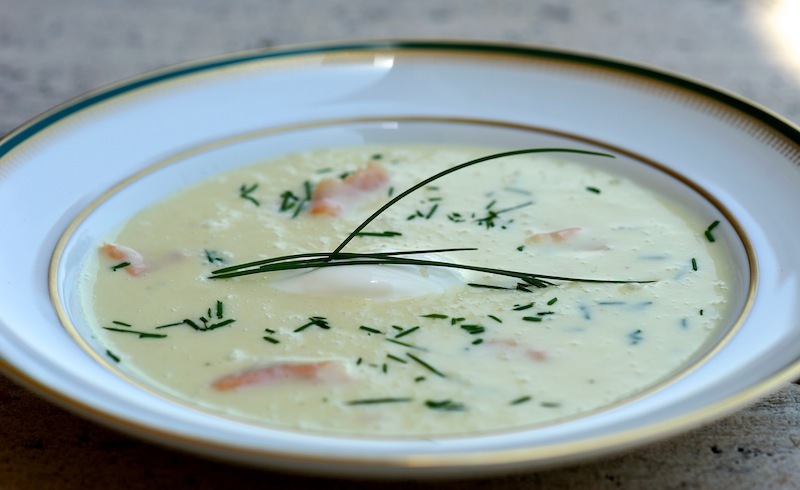 All the soups I have put so far in my blog have given me something special and this Potato soup with salmon is no exception. 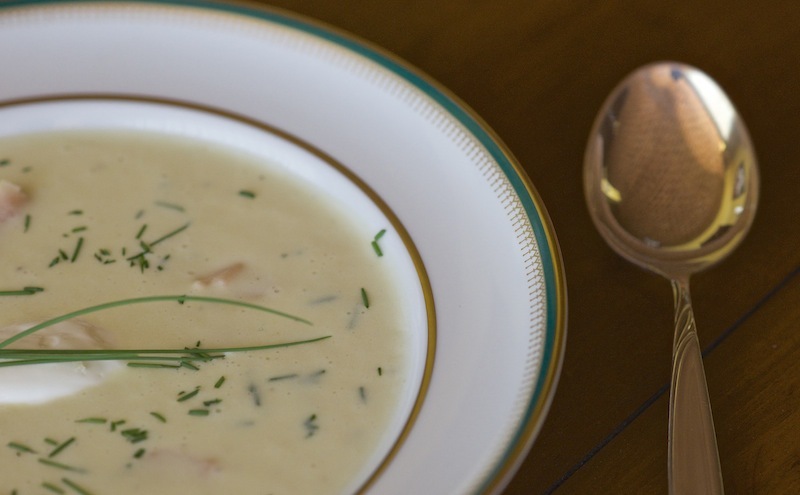 I love the creaminess which highlights the flavour of the leeks and potatoes and takes it to another level. 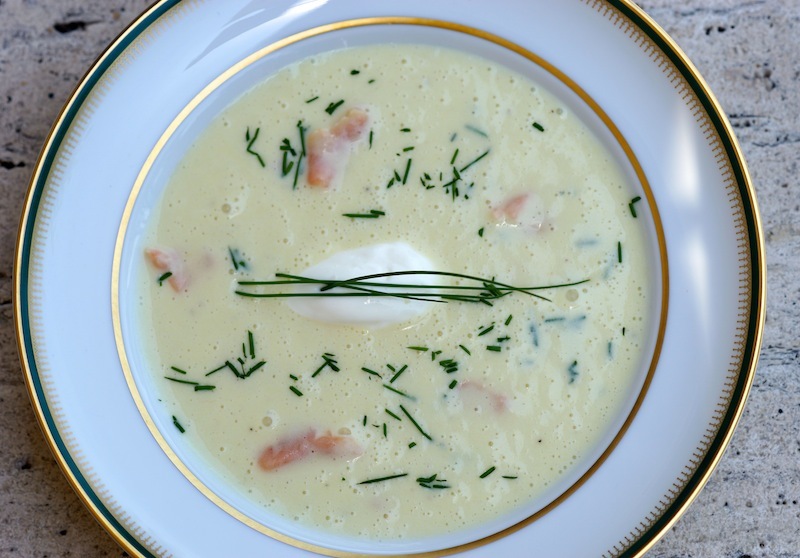 The smoked salmon slices bring that extra richness and the chives the garlicky final touch. This will also make a great starter if you are receiving guests. It is an elegant soup and you can get creative with the decoration. It was adapted from a recipe of Chef Monica Patino. Peal and cut the potatoes in small cubes. Put them in water. Thinly slice the leeks. Melt the butter in a casserole, add the leeks and cook until they are soft but not golden. Drain the potatoes and add them to the leeks. Pour in the chicken stock and cook in low heat for half an hour or until the potatoes are done. Add the fresh cream and season with salt and pepper to taste. Take into account that the smoked salmon is a bit salty so be careful not to put too much salt and pepper. You can always rectify the seasoning at the end. Once it starts boiling cook for 5 minutes more. Remove from the heat, let it cool a bit and then blend it. Put a tbsp of whipped cream in the middle of each plate. Spread the salmon slices all around and then pour the soup over it. Sprinkle with the chopped chives and decorate with the whole chive pieces.